Simonstown, South Africa's principal naval base, lies about 25 miles (40km) from the city centre and is a quaint suburb built around a naval dockyard, with well-preserved Victorian buildings, museums, sidewalk cafés, and local heroes. One such hero was a dog called 'Just Nuisance', who joined the British navy, becoming their mascot, when Simonstown was a British base. A statue of the beloved Great Dane can still be seen on the beachfront. 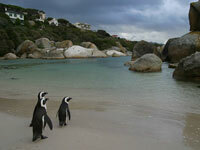 A short distance from the town is Boulders Beach, famous for its protected colony of African Penguins. People watch the animals while on the beach as well as from viewing platforms. The penguins are remarkably tame and although you shouldn't try to touch them, it is possible to get very close and take some wonderful photographs. The loveable birds continue to swim and frolic beneath the waves, totally unperturbed. The beach is truly beautiful at Boulders, with turquoise water and, as the name suggests, picturesque rock formations. It's worth a visit in any season just to see the penguins, and kids will love it!